We are delighted to announce that Hastings Borough Council, with the aid of Arts Council funding, have put together a fantastic package of entertainment on Saturday evenings on the Stade Open Space. 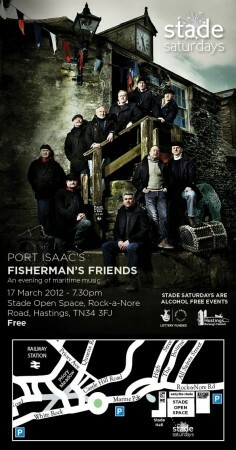 Kicking off in a very appropriate manner, are the highly acclaimed Fisherman’s Friends on Sat 17th March from 7.30pm. Previous post: Stade Sunday Music is Back!